This guide will provide four easy ways to begin exploring the data and functionality of the system. More detailed information can be found in the Atrium User Guide (coming soon). NOTE: Bold words or phrases are defined in the glossary. The family search is located on the Atrium banner. 1. Click the “Quick link to a family” control box on the Atrium banner. Click the down arrow on the right edge of the control to expand the list. 3. Press the first letter of the family you wish to see. The highlight will move to the first family beginning with that letter. 4. Click the family desired, or use the arrow up and arrow down keys to highlight the desired name and press the Enter key. 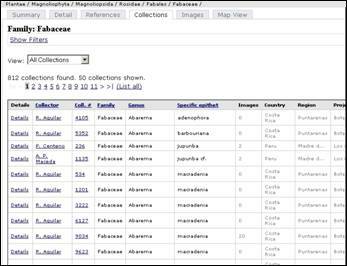 The system will automatically search the collection data and return the taxonomic display for that family. The Quick Search Collections field will allow you to enter any term or part of a taxon name. The search results has two tabs. 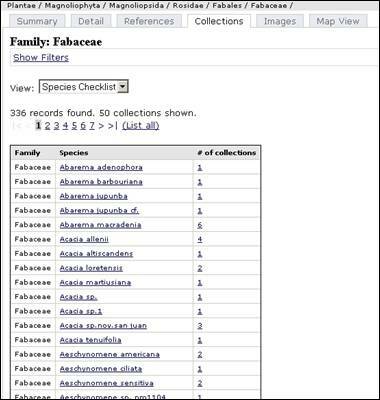 One shows collections that include the term or partial taxon name in the non-taxonomy fields. 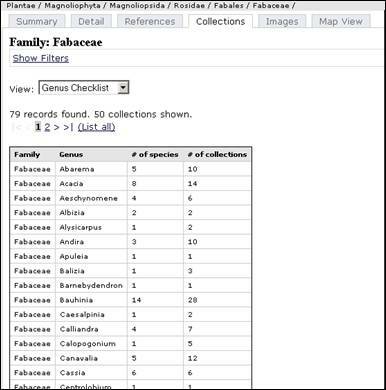 The taxonomy tab will show a list of taxonomic names that include the partial name. The list of taxonomic names includes synonyms and “near matches”. 1. Click the “Quick Search Collections” box on the Atrium banner. 2. Enter a term, partial name or collection number as desired for the search. 3. Click the Search button, or press the Enter key. The Search Results will list collections with those that sequence of letters in any text field for the collection. It does not include collections where the letter sequence is only in the taxonomic names. Clicking on the Collection Number will go to the detailed data display for the collection. Clicking a non-zero Images will go to the Images tab for the collection. Clicking on any of the underlined names on the Taxonomy tab will take you to the taxonomic display for that taxon. 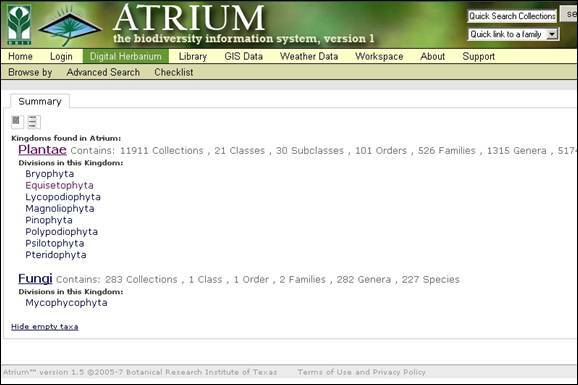 Below the slide show on the Digital Herbarium home page is a Keyword Quick Search. 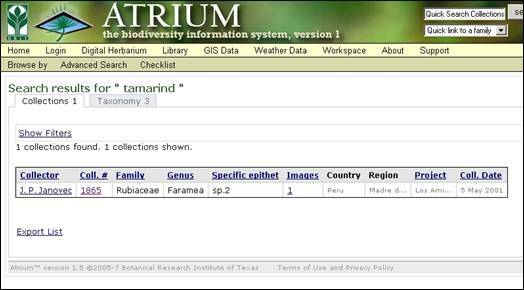 The Digital Herbarium home page is reached by clicking the Digital Herbarium on the main navigation bar. 1. Click on the Keyword box. 3. Press Enter to begin the search. The Search Results will show collections that include keyword in the text fields for the collection. 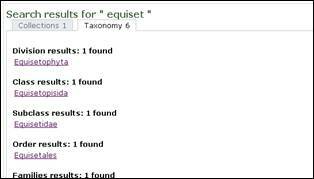 Clicking on the Taxonomy tab will show the taxa related to that keyword. 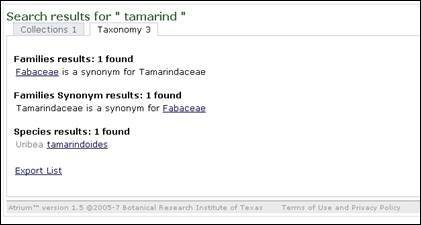 Clicking any of the underlined names on the Taxonomy tab will take you to the taxonomic display for that taxon. 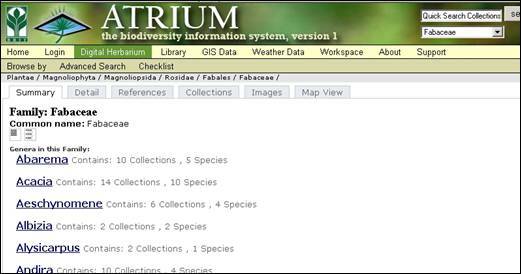 In the Digital Herbarium, Browse by Taxonomy is the first menu choice, and it places you at the top taxonomic level, Kingdom. 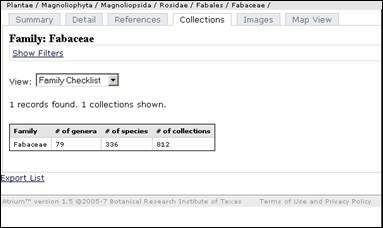 As you move through the taxonomic levels, each new summary tab will present the number of collections at the current level, and the number of taxa in each lower level. The names of the next one or two levels below are displayed for you to choose. To indicate your choice of taxon, place the mouse pointer over the name and click the left button once. The taxonomic display will change to the taxon listed, with the same tab to the front as in the previous choice. You select to show one or two lower levels by using the two page icons directly below the Summary tab. The example above is set to show two levels, kingdom and division. If it were set to one level using the left icon, only the kingdoms would be listed. 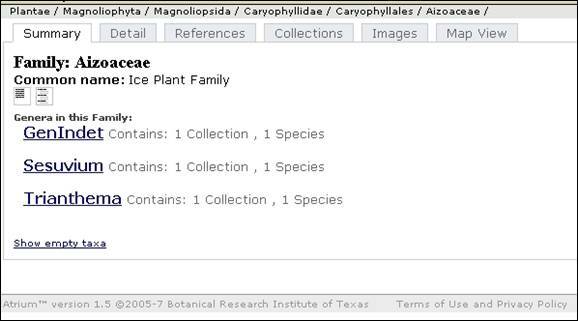 You can also choose to show or hide empty taxa by clicking the text at the bottom of the tab. search results A display of collections and taxonomy results from a search. The taxonomy results include synonyms. “Near” matches are provided if no exact matches are found. taxa trail The names of each taxon in the path down to the taxon displayed. Usually these names indicate choices made when using the Browse by Taxonomy method of finding collection data. taxonomy display The main display of taxonomic and collection data. Note the 6 tabs at the top of the panel: Summary, Detail, References, Collections, Images and Map View. Each of these presents different information for the taxon presented. Just above the tabs is the taxa trail showing the levels of taxonomy down to and including the level displayed.